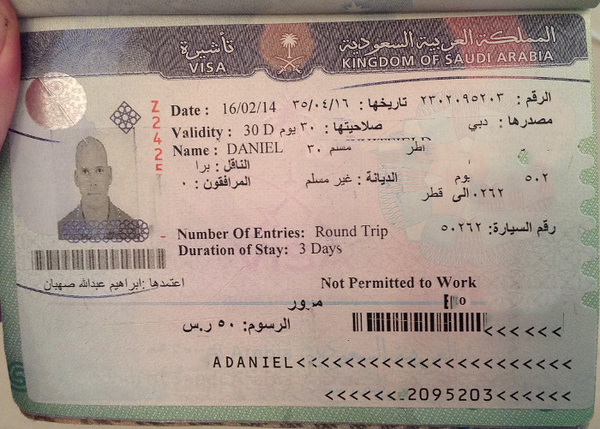 My road trip to Qatar & Saudi Arabia. 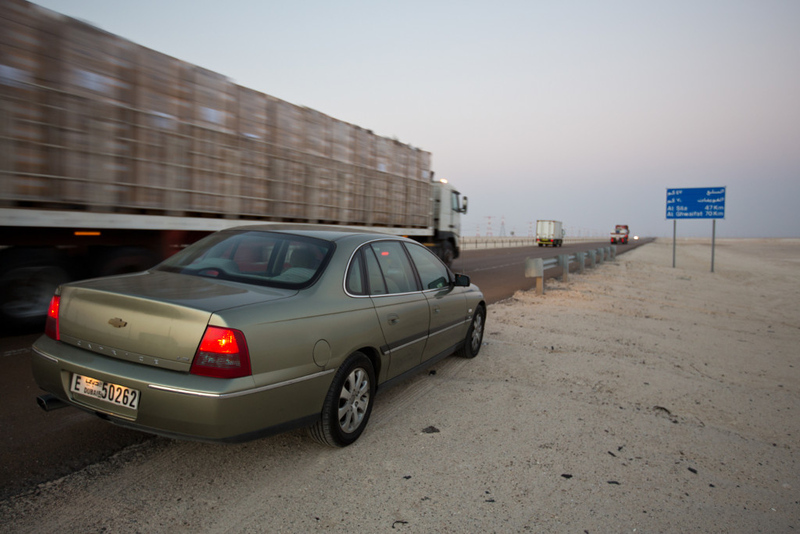 After organising about 10 different pieces of paperwork, and a few false starts, I was successful in getting a 3 day transit to travel overland from the UAE to Qatar via Saudi Arabia. 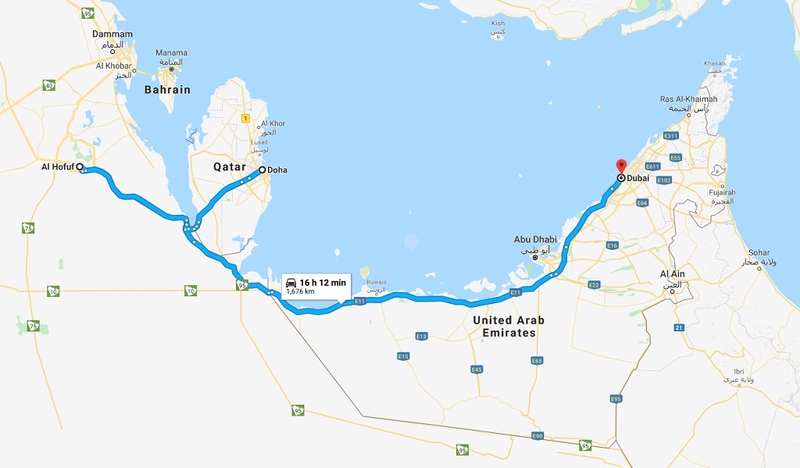 The plan for the trip was to drive from Dubai to the city of Al Hofuf in the Eastern Province of Saudi Arabia, a distance of ~700 kilometers (435 miles). 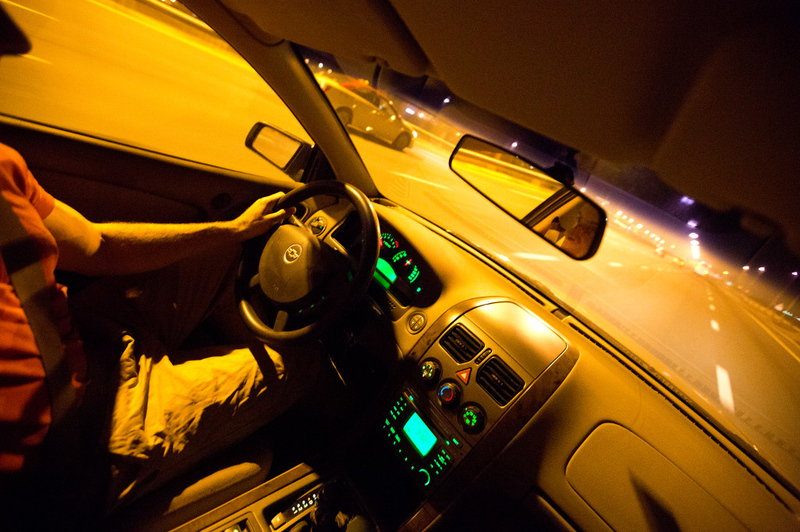 After getting up at early Friday morning, I was on the road and heading west by 3:30am. 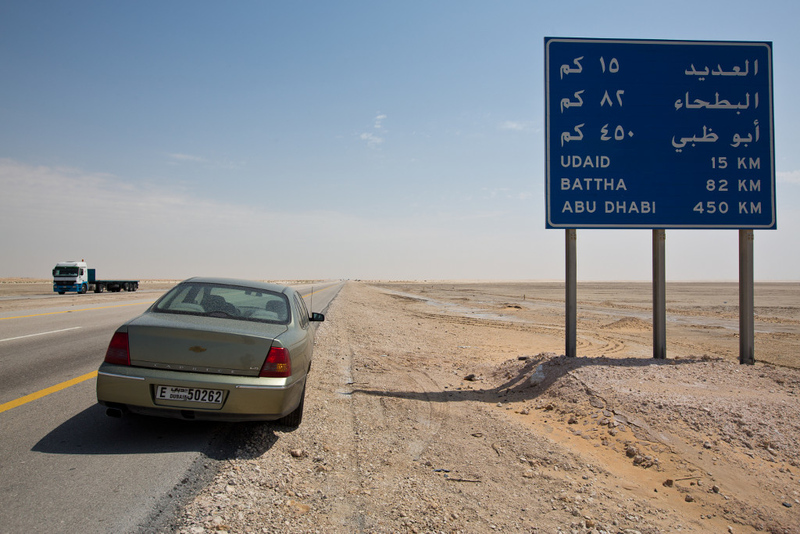 About to take the Abu Dhabi bypass road and on to Saudi Arabia. 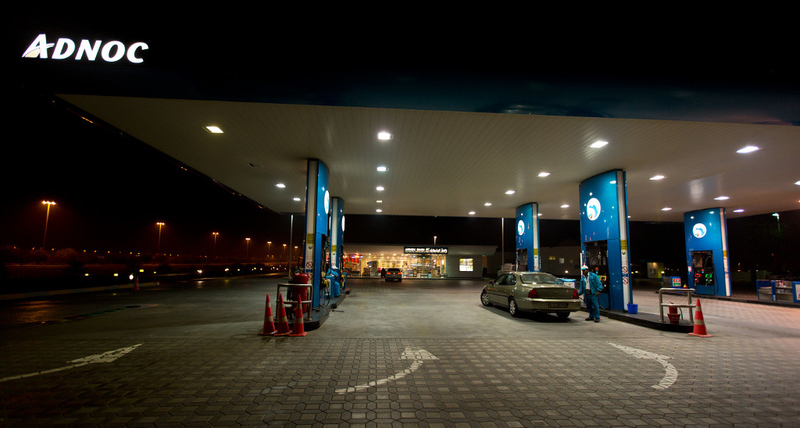 Topping up the tank before the long drive to the UAE-KSA border. 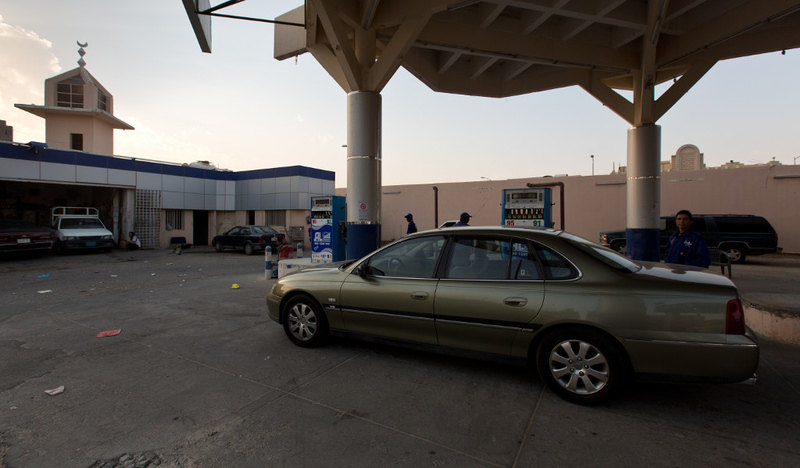 Petrol price = $US0.48 per liter ($US1.80 per gallon). Dawn on the drive west. 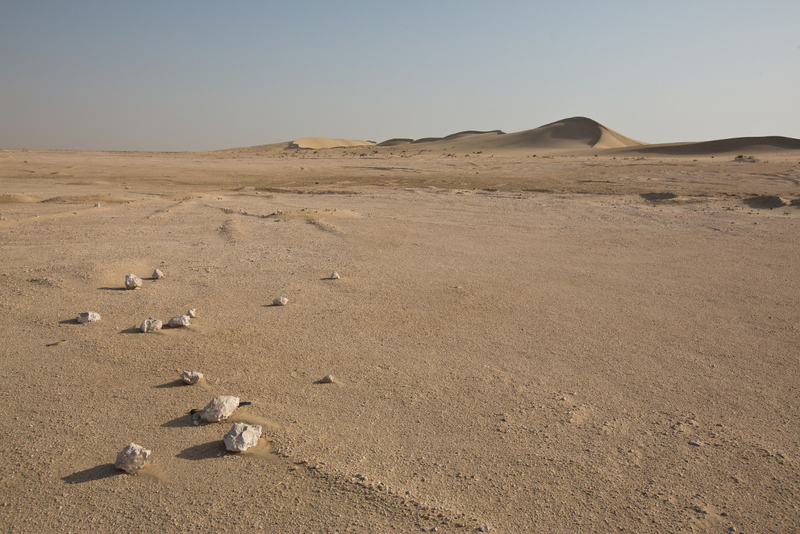 In the distance on the right the UAE government is spending $30 billion to build a 4 reactor, 5600 MW, nuclear power plant. 70 more kilometres to the border. 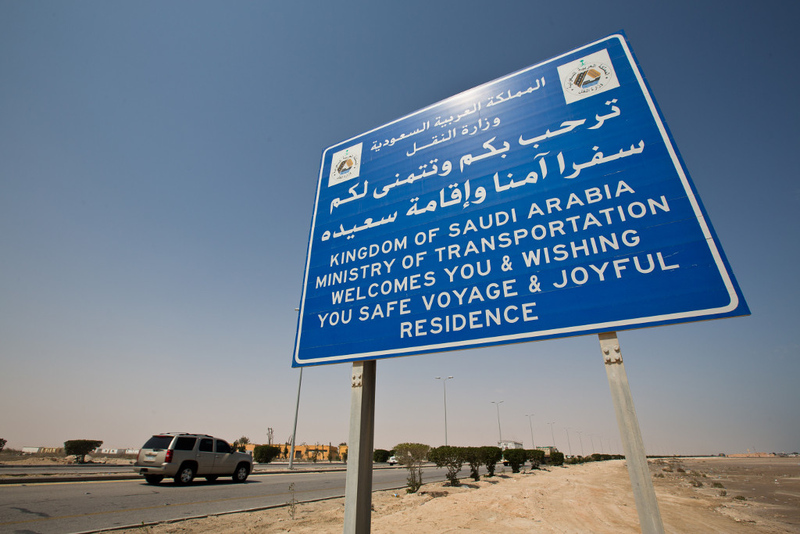 ...and making a successful crossing into Saudi Arabia! 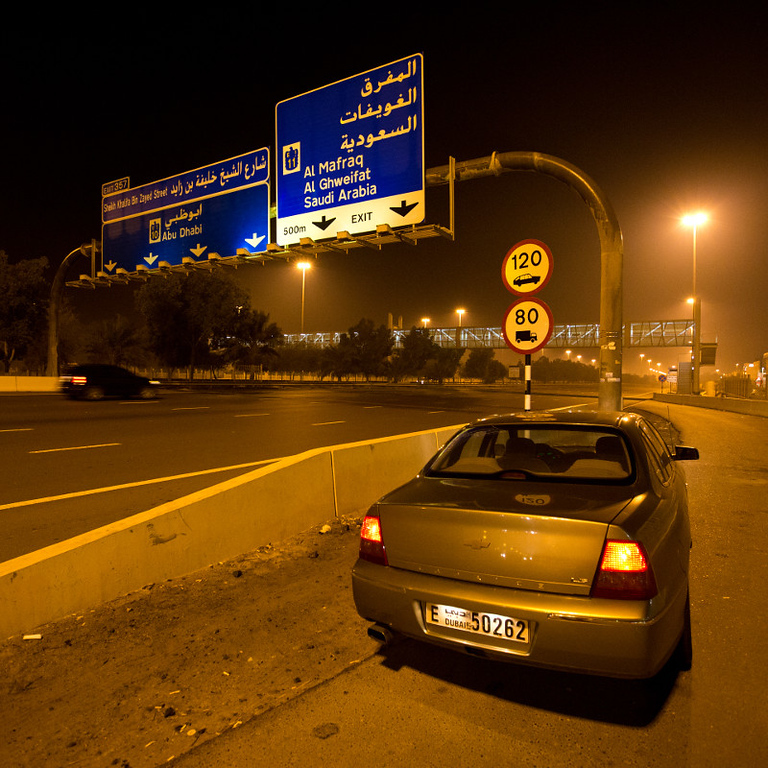 The border crossing was relatively painless and took ~40 minutes from start to finish, and involved paperwork and paying a 35 AED (~$10USD) exit tax on the UAE side, crossing no mans land, then processing my passport, car registration, fingerprints, buying car insurance and then a vehicle inspection (for contraband) on the Saudi side. 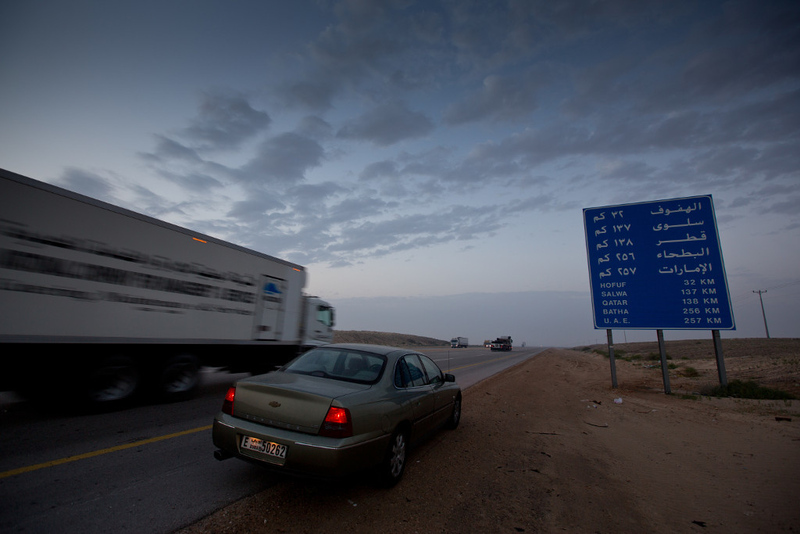 The Saudi border guys were quite friendly and polite too. 266km's to my destination Al Ahsaa/Hofuf. 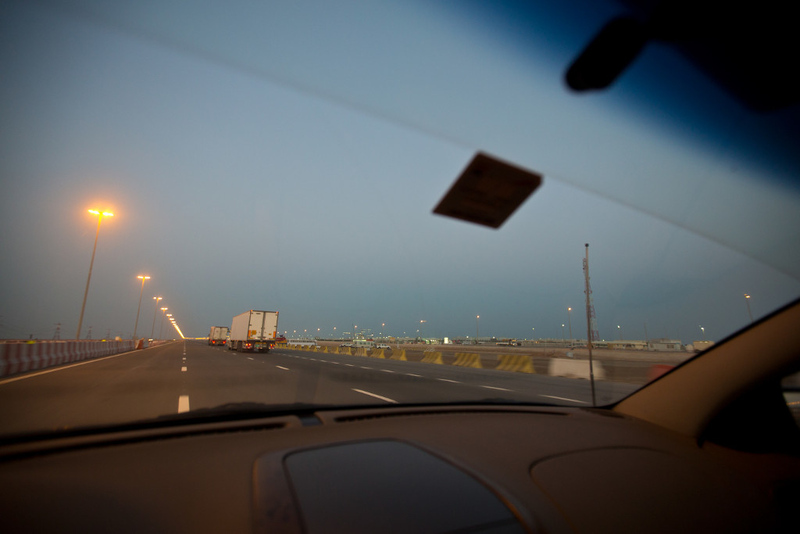 Some of muslim colleagues have driven overland to Makkah, which is ~2000 km's from Dubai! 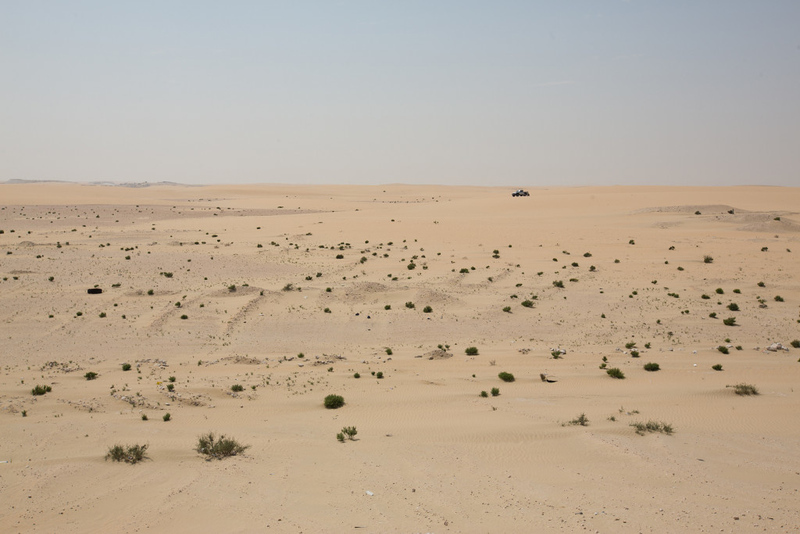 Stopping on the way to admire the barren but still beautiful Saudi desert. 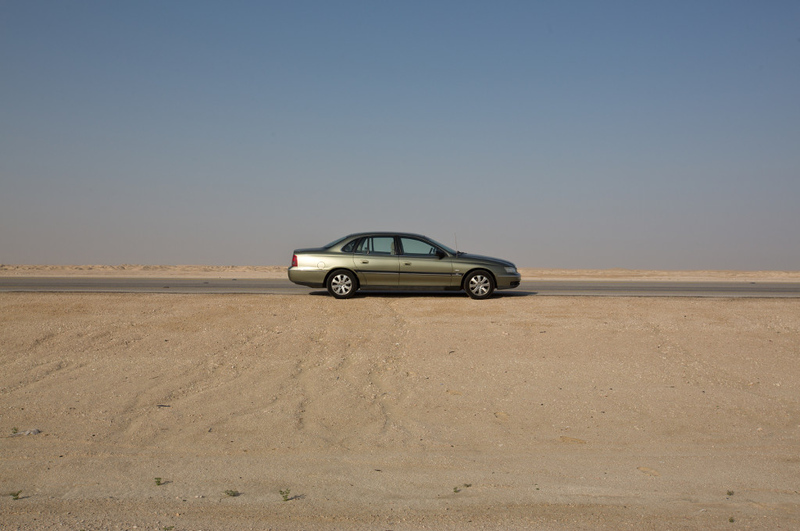 The Chevy V8 really lapped up the long stretches of straight desert road. Another trip that didn't end too well though. 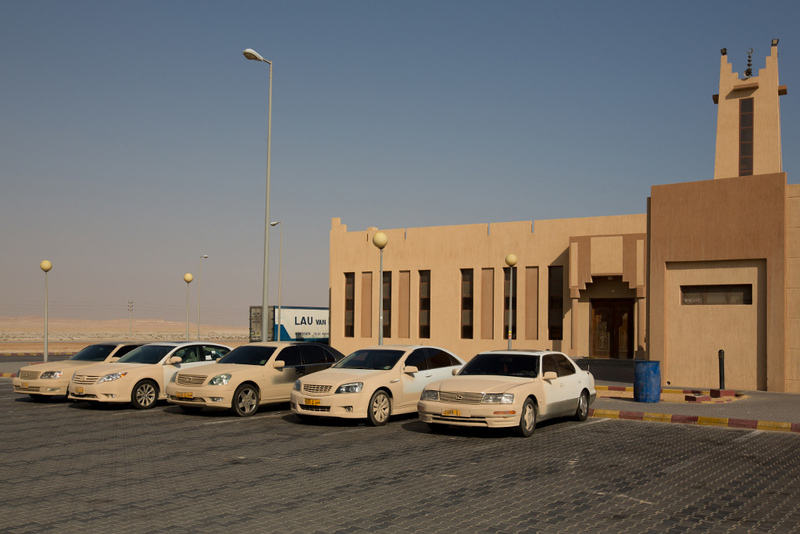 A row of 'mud' sprayed cars at a roadside Mosque at Salwa, near the KSA-Qatar border crossing. 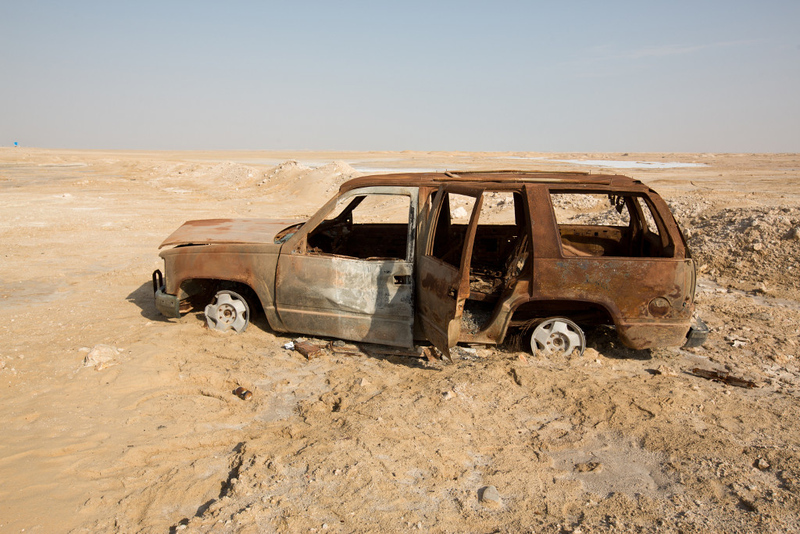 The 'mud' is to protect the car paintwork from being literally sandblasted from driving across the desert. 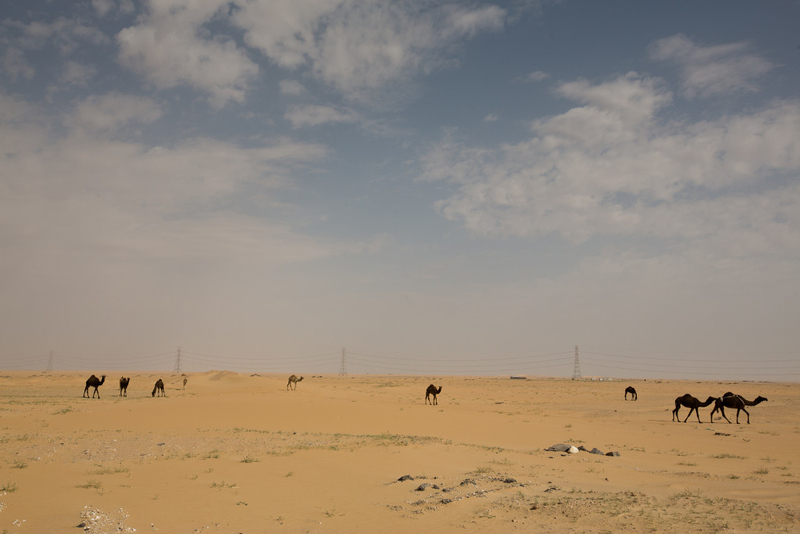 Camels on the road to Hofuf. 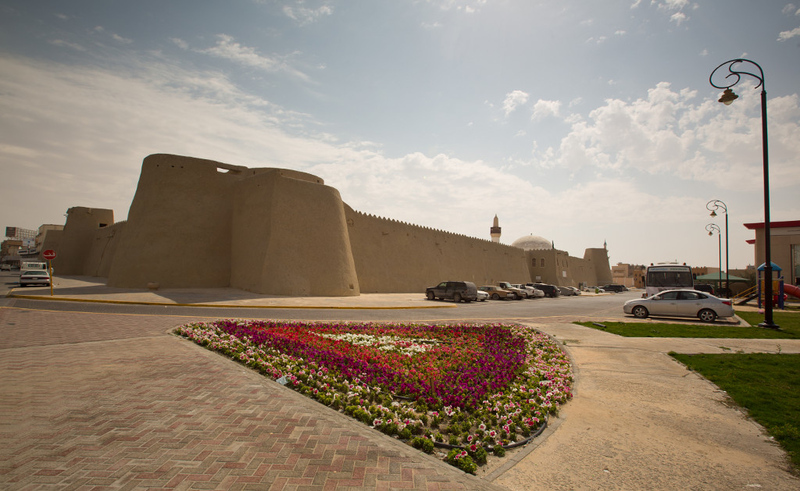 Ibrahim Palace, built in 1555 by the Ottoman empire. 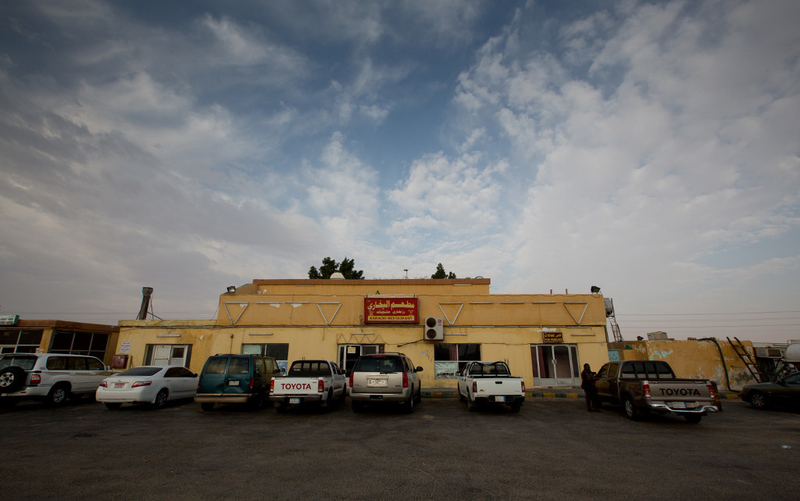 I arrived in Hofuf at about midday. 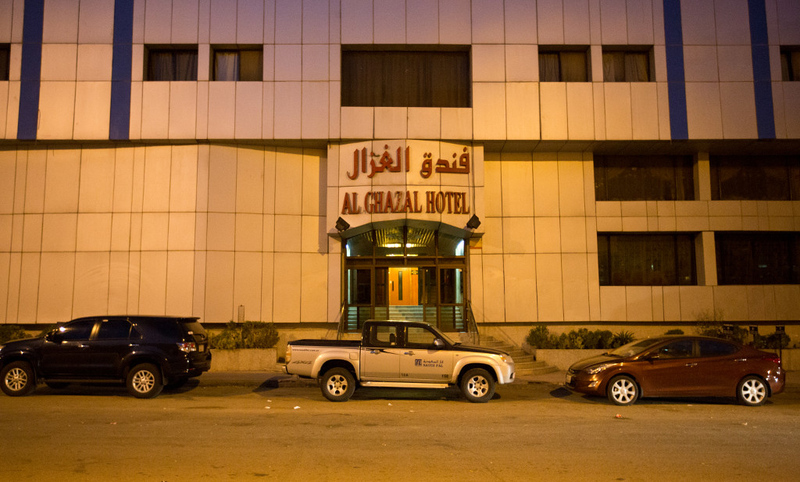 I then checked in at the Al-Ghazal Hotel. 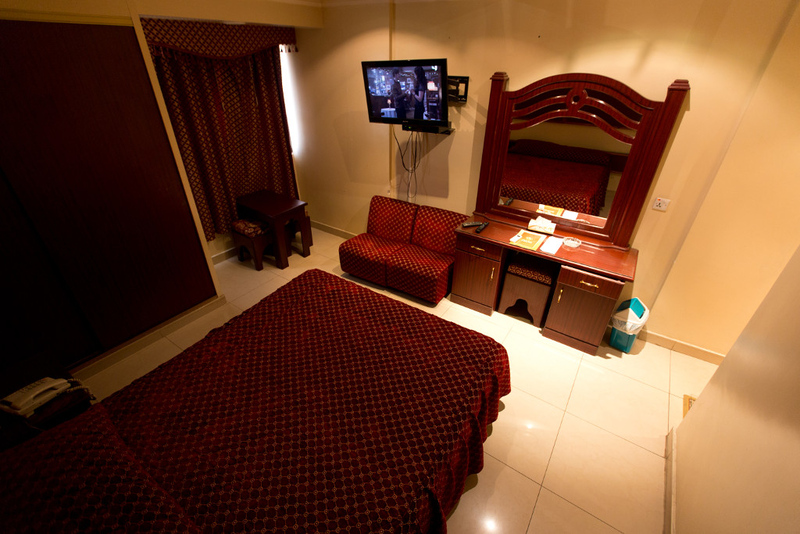 Very reasonable for 137 riyals (~$US37) for the night. After crashing for a bit after the early start and long drive, I headed out to explore the city. 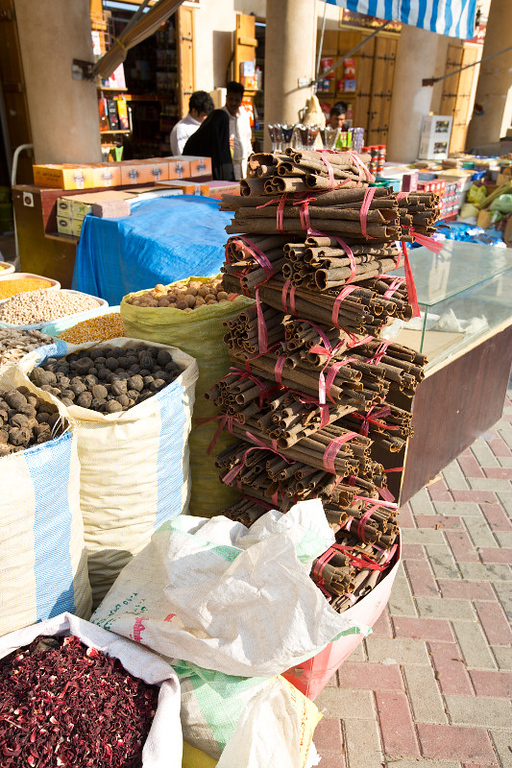 Cinnamon & spices at the local souq. 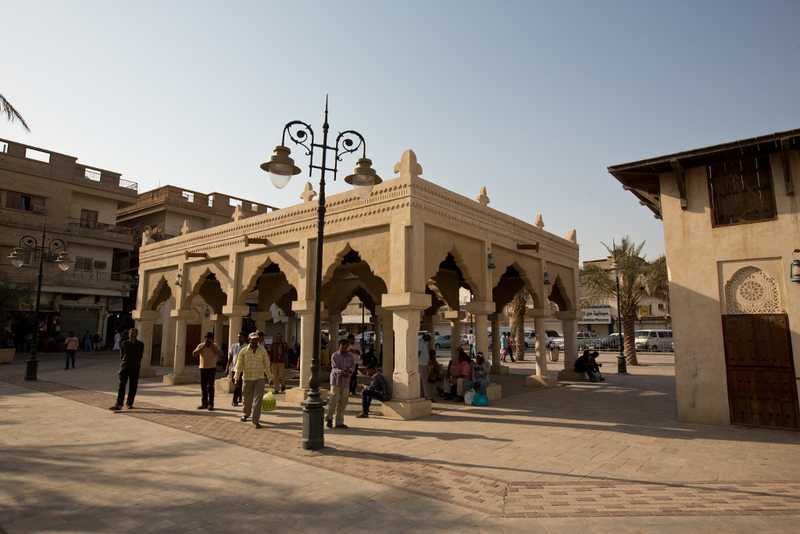 Asian expats relaxing in the square on their day off. 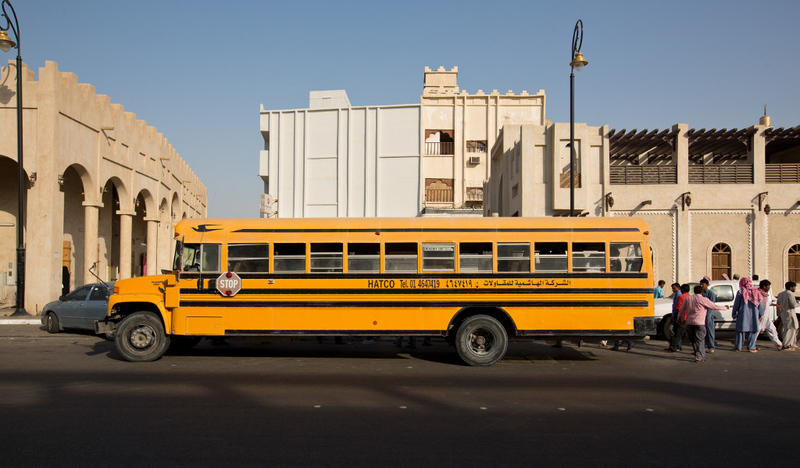 An old American school bus now in a second life to transport labourers. 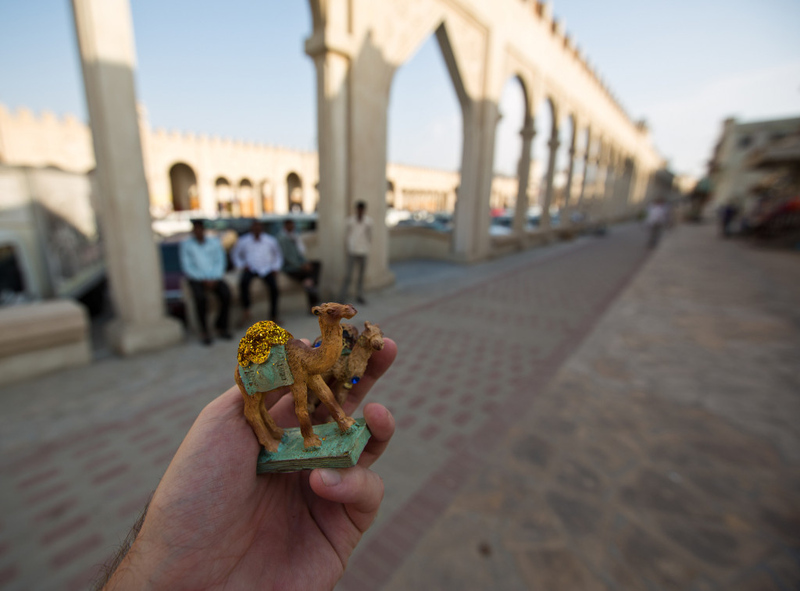 I bought a couple of souvenir camels for 3 riyals ($US0.80) each. 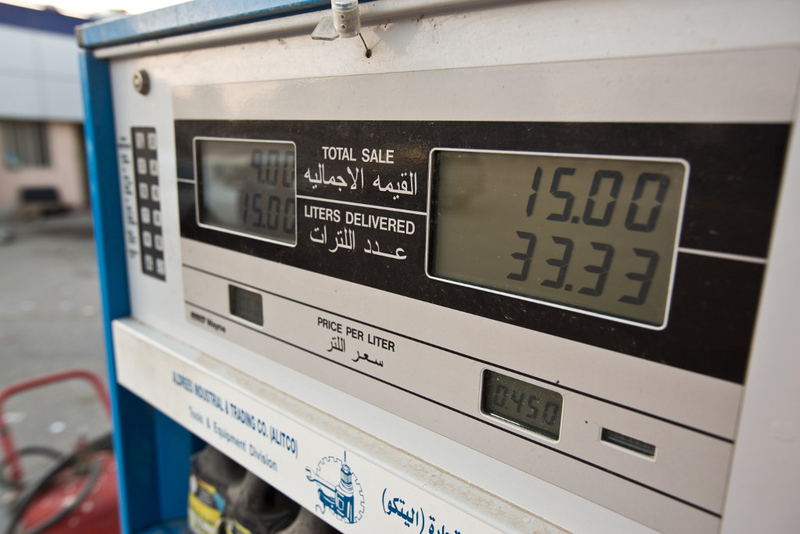 ...for only $US0.12 a liter ($US0.45 a gallon)! I had dinner at a local restaurant, and got a decent feed for 64 riyals ($US17). Got up early on Saturday morning, checked out of the hotel, and was on the road by 5:45am. 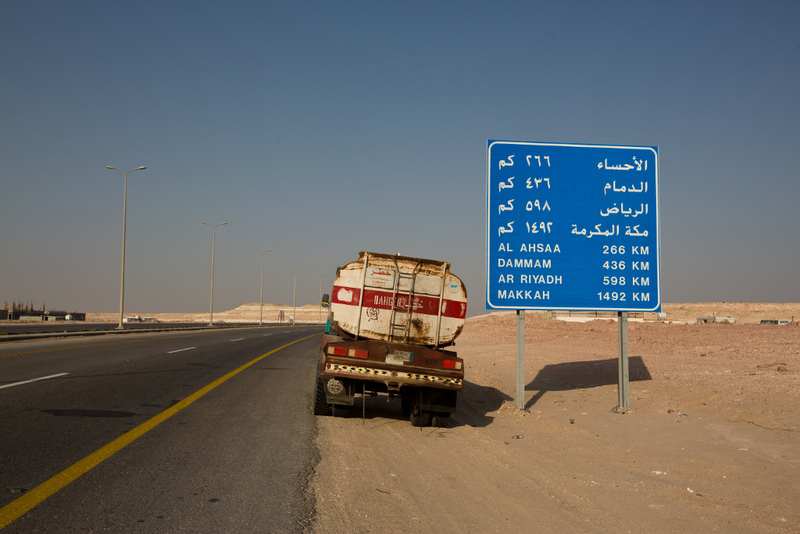 138 kilometers to the Qatar-KSA border. 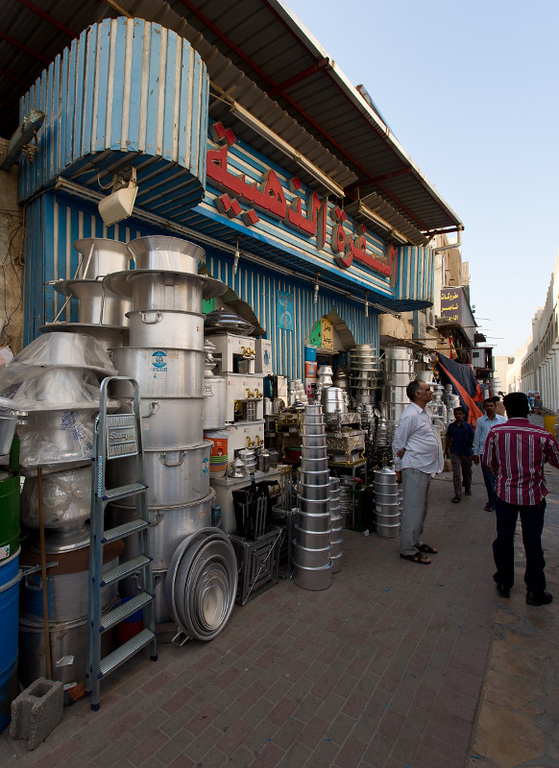 At a roadside restaurant for a pitstop before heading over the border into Qatar. The border crossing was again very easy, and ~40 minutes from start to finish. 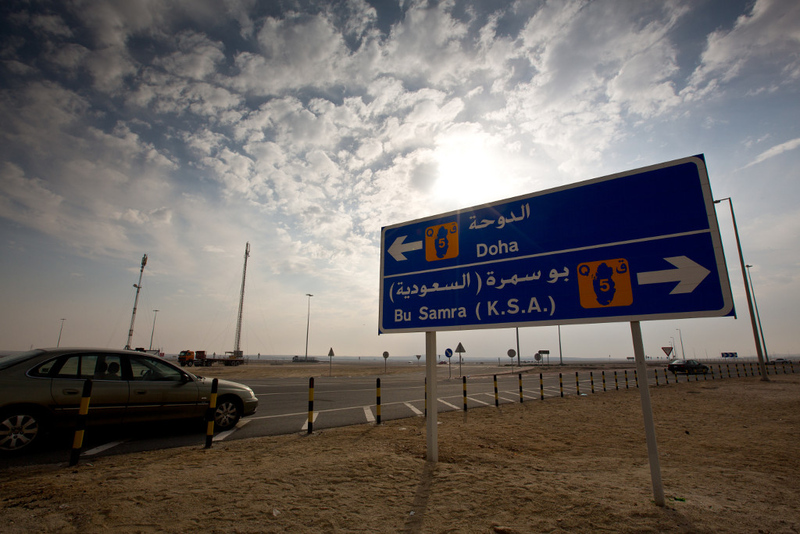 I then headed on the main highway north-east to Doha. 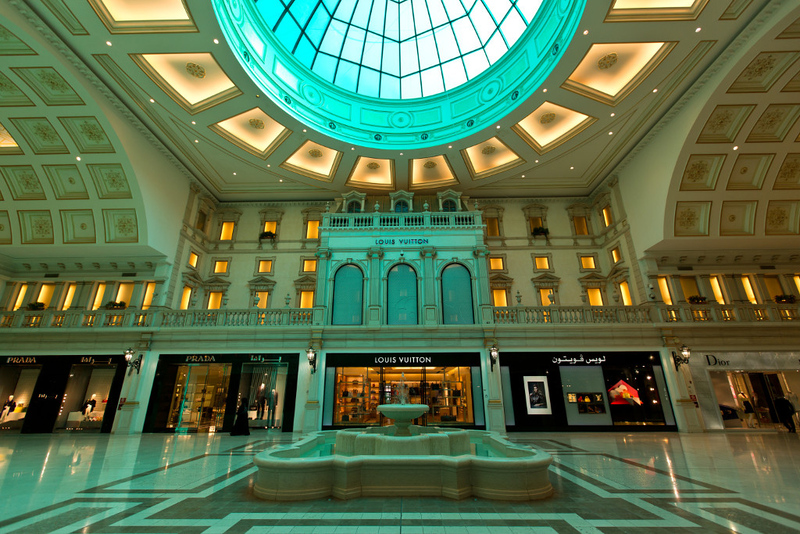 At the Villagio Mall in Doha. A Kuwait team taking on the locals in an ice hockey match. 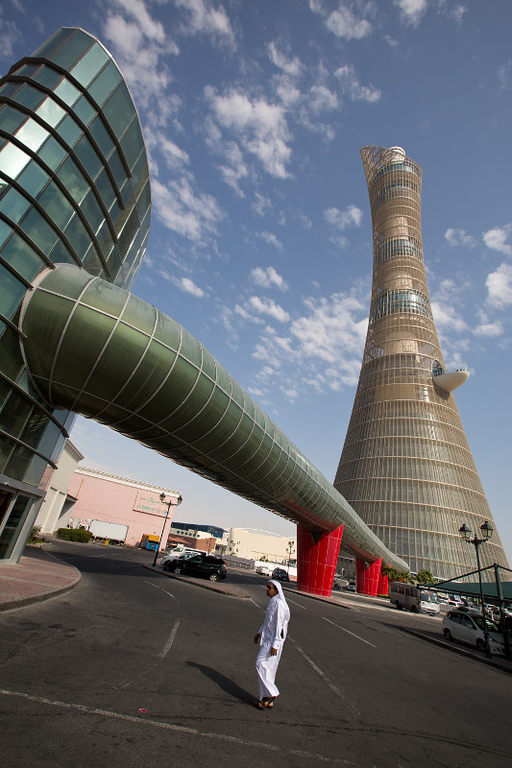 Aspire Tower, built for the 2006 Asian games. 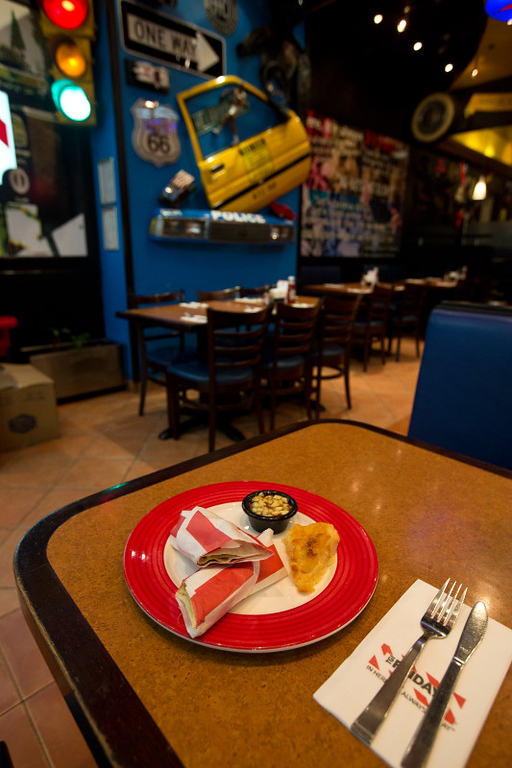 Breakfast at TGI Fridays to fuel me for the long drive back to Dubai. 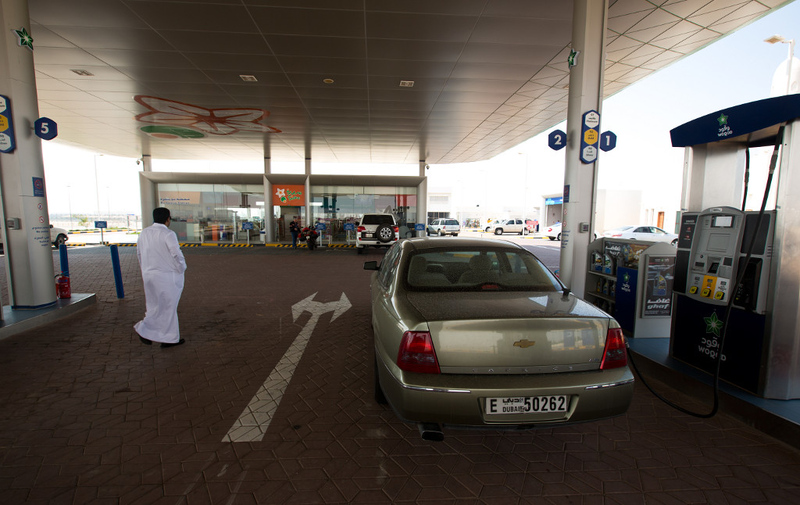 Filling up the tank again in Qatar. 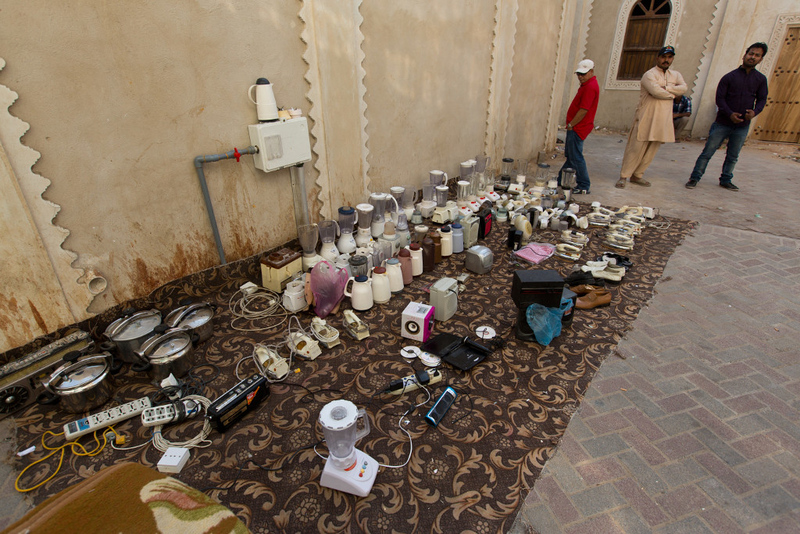 The price was about double that in Saudi, but about half that of the UAE. 82 kilometre's to the border. Some locals doing some dune-bashing. Getting some Saudi chocolates for my colleagues back in Dubai before crossing the border. 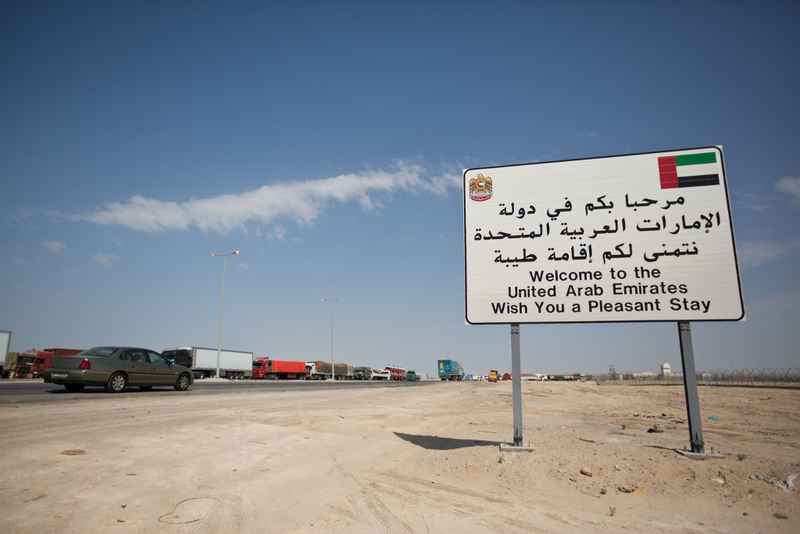 After the third and final border crossing for the day, I was back in the UAE! 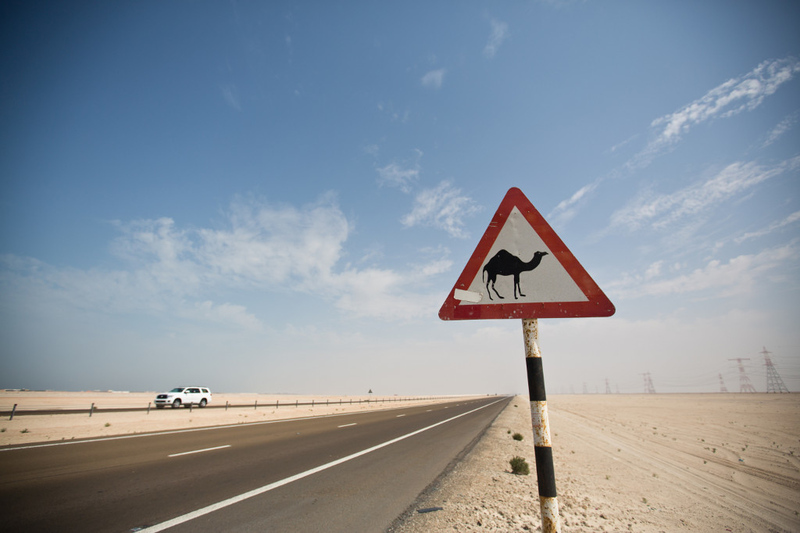 On the home stretch, but still keeping an eye out for stray camels. Back home in Dubai after driving 1682 km's over 2 days!